A knowledge exchange partnership that shares experiences that can reduce flood and drought impacts – a collaboration of professionals working across diverse disciplines who all have flooding as a cross cutting theme to consider – and who have a background in the public sector, industry, universities, NGOs and international colleagues from around the world. Addressing water management opportunities and challenges in flood and drought scenarios in urban and regional settings is a global occurrence. In Queensland, the significant impacts of extreme flood events (2010-11 and 2013) has resulted in a focus for government agencies and communities to seek solutions that can provide long term benefits and enhance community resilience to future extreme events. 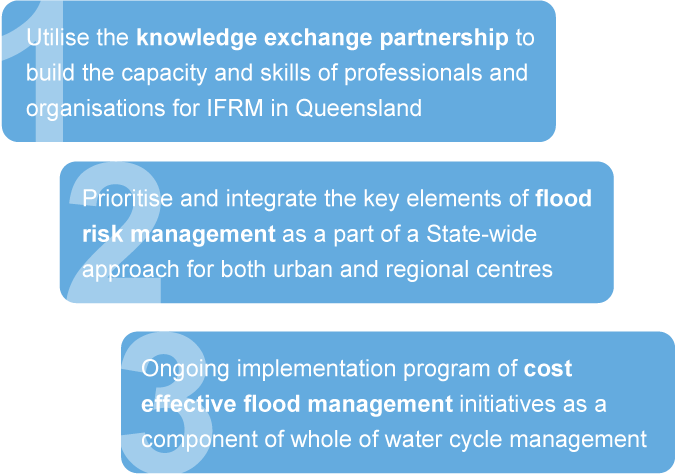 The role of this CoP is to provide foundational awareness, skills and expertise to Queensland’s professionals and organisations who are involved in integrated flood risk management. This platform provides an opportunity for flood risk management initiatives in Queensland to be planned, developed and implemented based on an understanding of effective approaches used in Australia and other parts of the world, with a special link with the Netherlands, and adapted to meet specific Queensland urban and regional needs. Professionals from any discipline with any interest in flood and water management are invited to share their knowledge and expertise in integrated flood risk management through this Community of Practice. Currently we are most active in Brisbane and have a broader Queensland interest in application of our shared experiences. When opportunities arise we involve international visitors to meet with the collective and share their experiences and what that might mean here in Queensland.